Win With Gu and Us Just Make Your Own Flavour! Gu are running a competition right now where you could win a portion of the profits from a new flavour. Yes – that’s right – A PORTION OF THE PROFITS! Not just a bunch of Gu – but part of the profits! Not sure about the flavour? Just want to win some Gu? 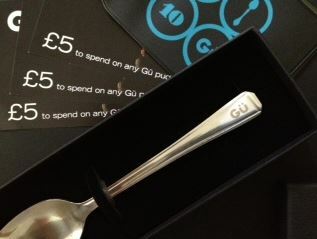 Well, Gu have given us £15 in Gu certificates for Gu Puds, a ticket holder if you’re a commuter like me or an Oyster Card holder if you’re a Londoner, and a lovely spoon to eat all that Gu with with an engraved handle. 17 Responses to Win With Gu and Us Just Make Your Own Flavour! Much as I love chocolate, it’s key lime pie. Well up until now I have to say I loved the Lemon ones the best but I read your blog on the After Dark New York Cheesecakes and was tempted into trying them – Well, what can I say other than they are heavenly! Absolutely love these – my new number one! I haven’t tried the Gu York Cheesecakes (yet!) but I do love the Chocolate Melting Middle puds, delicious! Loving the freshness of the key lime pies! I love hot, gooey chocolate cakey desserts, always have. It’ll come as no surprise that I love their Chocolate Ganache pudding. GU did a ltd edition Belgian chocolate pudding a few years ago….heaven in a glass pot! Chocolate fondants for definite. OM NOM NOM. I just adore Hot Chocolate Souffle, try as I might I can never recreate them at home. They are so divine, my one desert of choice and I indulge near on every week. The crust is just delicious and crunchy but the Gu centre is what I’m really talking about. I most definitely have a massive sweet tooth, I’m going to try their cheesecake next. I am in love with the hot chocolate soufflé. They are something that tickle my tastebuds! Its simple but delicious! We love the hot chocolate melting middles, the melting chocolate is always perfect and the outside light and fluffy, complete and utter heaven. Ooh! My favourite Gu will always be the melting chocolate fondants. Soooo amazing. I love the Melting Middles. They are ready so quickly and really hit the spot! We hide them from our four year old, who is too young to appreciate the deliciousness (although I’m sure he’d eat one right up!). The box of two is just for us to savour after the kids are in bed. The chocolate souffle is delicious and live the mini pots as well! It seems that I’m another chocoholic here….the chocolate souffle one gets my vote, too! Soooo delish although I try not to give in to temptation TOO often! Lol.